Kitty Hawk lives in a small fishing village in Canada. As summer approaches Kitty lobbies her favorite clothing company for a grant to spend her vacation studying whales in Alaska with her De Haviland Beaver seaplane. The summer starts well enough and Kitty is amazed at the sights and up-close encounters she has with the wildlife. She even manages to make a friend when she catches the eyes of a local fisherman who is right around her age. But when a suspicious boat piques her interest over several appearances Kitty starts formulating wild theories of lost Yukon treasure and murdering gold thieves. With just a few weeks left and most of her research complete, Kitty refuses to listen to her inner voice and sets out to investigate what may very well be nothing but could also possibly turn into the biggest adventure thus far in her young life. For a girl with aspirations of circling the globe like her idol Amelia Earhart, this is saying a lot. Kitty Hawk and the Curse of the Yukon Gold is the first in the Kitty Hawk Flying Detective Agency Series books by author Iain Reading. Kitty is a strong-willed, clever teenager who gets herself into a fair amount of trouble in this book. From up-close encounters with humpback whales to a run in with gold thieves and even a brush with Indiana Jones himself, Kitty has a summer vacation that will not soon be forgotten. Written for more of a younger audience, the story is very easy to follow and not too bogged down in details. I loved Kitty’s seemingly endless arguments with her “inner voice” as well as the bond she forms with the unlikely band of brothers after their adventures up and down the Chilkoot Pass. Reading does a really good job crafting a story that is not only enjoyable but also educational. With the main back-story being centered around the Klondike gold rush of the late 1800s there is quite a bit of history to be incorporated and Reading clearly knows his stuff. I’m pretty sure that after reading Kitty Hawk and the Curse of the Yukon Gold I now know more about that period of history than I ever have, and it’s piqued my interest in taking a trip out to Alaska in search of some of the locales depicted in the story. 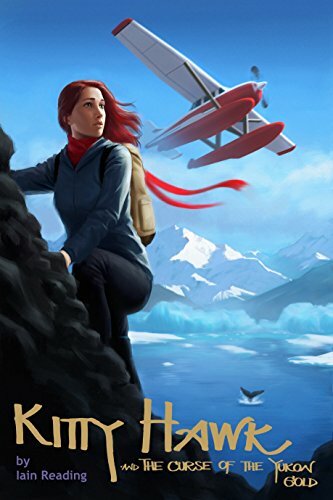 If you are looking for a story that not only is an easy read but also a very enjoyable stealth history lesson, I would recommend Kitty Hawk and the Curse of the Yukon Gold. For me, the best part is that this is the first in a series of going on five novels to date and if this introductory offering is any indication, I ’m sure they will also be jam-packed with action, adventure, peril, and more stealth history lessons.